The Sno Konette was the worlds first complete ice shaver with display case. It began its life back in 1947 and has been improved dozens and dozens of times!Truly a shaving powerhouse! This machine is the "Grandaddy" of complete Sno-Kone® machines. 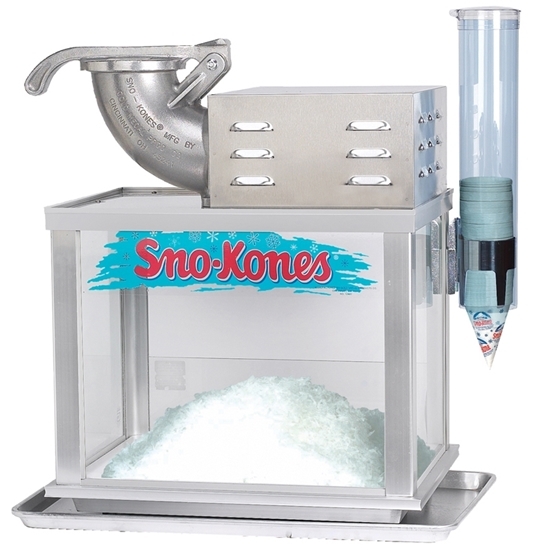 The 1003S Sno Konette features a 1/3 HP, 1725 RPM high speed shaver mounted on an extruded aluminum cabinet with tempered glass windows. To operate, simply lift the pusher handle, fill with virtually any size chunk or cube of ice, close the lid, turn on the motor, and pull the handle. You can vary the fineness of the finished snow by using colder ice, putting less pressure, or setting the blades to shave more finely. In hot weather, the quality of the snow improves as the machine cools. Shaves up to 500 lbs. per hour. Includes: Sno-Kone (GM1088) dipper, drain pan, ice scoop, & cup dispenser. Dimensions 22" W x 16" D x 19" H.
Electrical 120 Volts, 712 Watts, 6.8 Amps. Ship weight 87 lbs., Cannot ship by UPS.